PalmInfocenter is in attendance CTIA Wireless and IT Show being held this week San Diego, California. 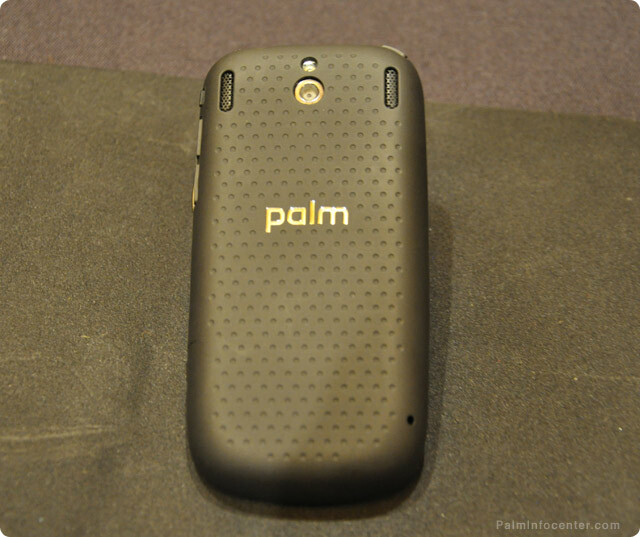 I was able to spend some time with the upcoming Palm Pixi at a press event. Sprint was on hand to showcase a number of their latest smartphones and services including the Pixi and various other newly announced Android models and feature phones. 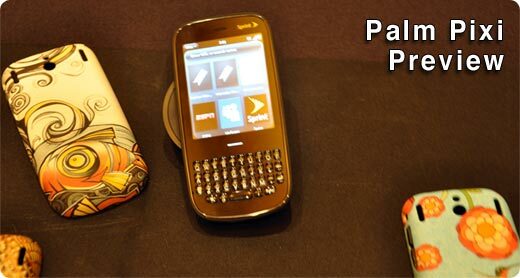 Read on for our quick sneak peak Palm Pixi preview and high res photo gallery. Unfortunately, there is little newness to report, as Sprint and Palm are still quite silent on expected availability and pricing. It seems the Pixi may be positioned much like the Palm Centro, so we expect to see some attractive pricing options once this one debuts probably later in November. Now onto the Pixi… First impressions, it is an attractive and svelte understated little smartphone. The Pixi has and incredibly light feel (just under 100g/3.5oz) and a natural curvy shape that is most ideal for messaging. Longtime Treo/Centro users will feel right at home here and for those that prefer the fixed candy bar form factor, this is it. Despite the imprudent lack of WiFi, I walked away pretty impressed with the overall package. I assume the speedy Sprint 3G service will be more than adequate for most users assuming you are in an area with decent coverage. As far as performance, the Pixi sports a different chipset than the Pre. Overall responsiveness felt on par with the Pre, but app loading, photos and web browsing felt a bit behind when compared with the Pre. However, it will be hard to truly judge until the final version debuts. 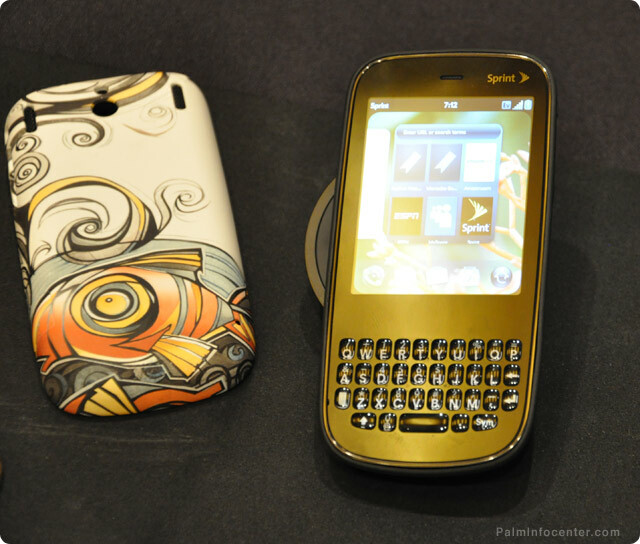 Sprint had its lineup on display with a heavy emphasis on the new Palm gear. Pictured above is the Palm Pixi along with the selection of Artist commissioned replacement back covers designed for the Pixi. Also in the distance is the newly announced Samsung Moment and the Pre. Palm Pixi Closeup. Note the lack of fingerprints. Keyboard close up. The keys felt a little narrower and more domed shape than the Pre. Overall though, the keyboard felt pretty easy to use. Add in a row of number/function keys, microSD and wifi and it might just be near perfect. 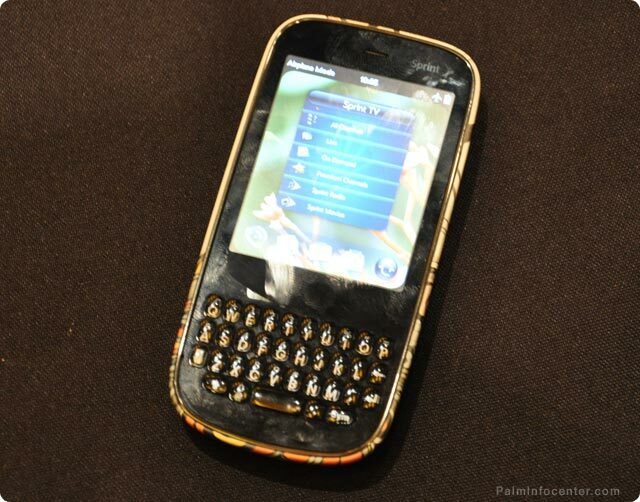 The Pixi's touchstone compatible soft touch back cover. It felt nice and quite grippy. Not sure if I dig the the perforations. Also note the odd position of the microphone hole to the rear left side. Here's another angle on the Pixi plus a shot of Palm's upcoming webOS Facebook app, it did not seem to be working on this demo unit. Pre and Pixi keyboards side by side. The Pixi will feature replacement back covers. 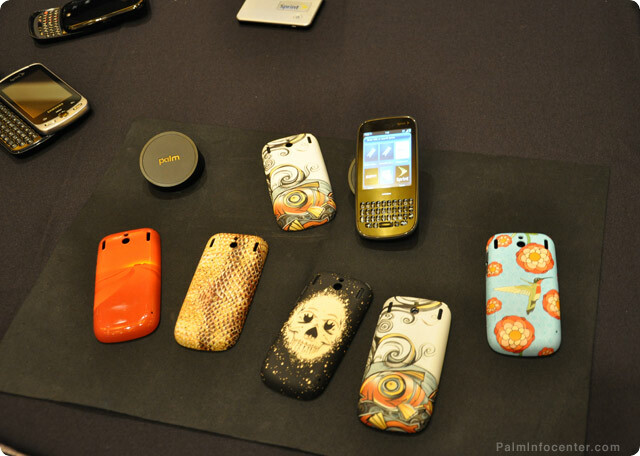 Sprint was showing Palm's artist collection and a rep said more choices will be offered such as solid colors and other designs. 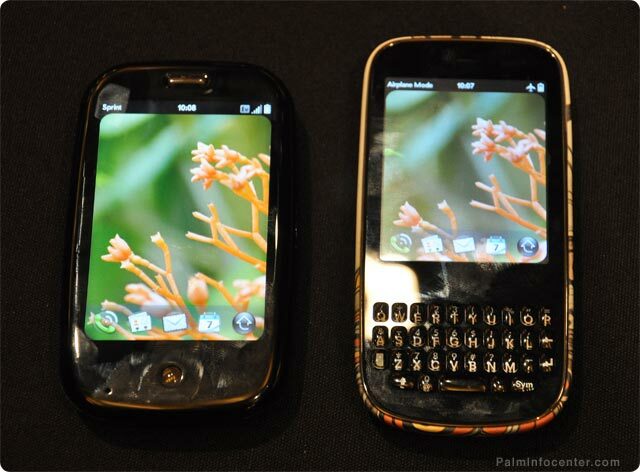 Palm's artist covers will also be touchstone compatible. 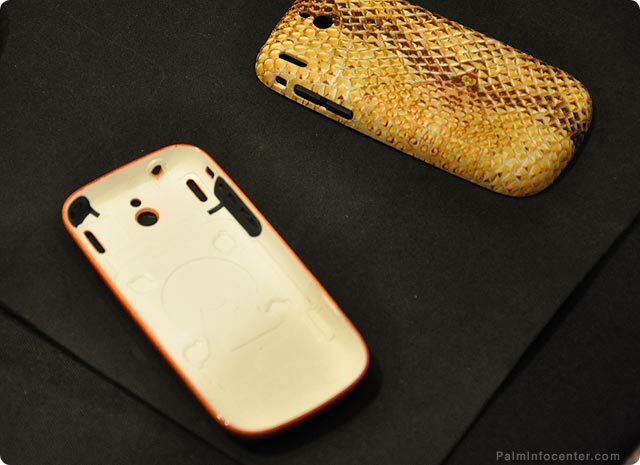 Snakeskin anyone? 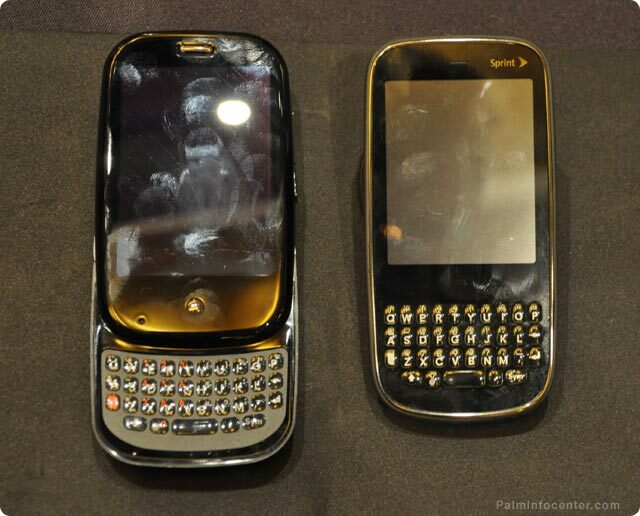 The glossy finish, fingerprint magnet design fad iterates on…. 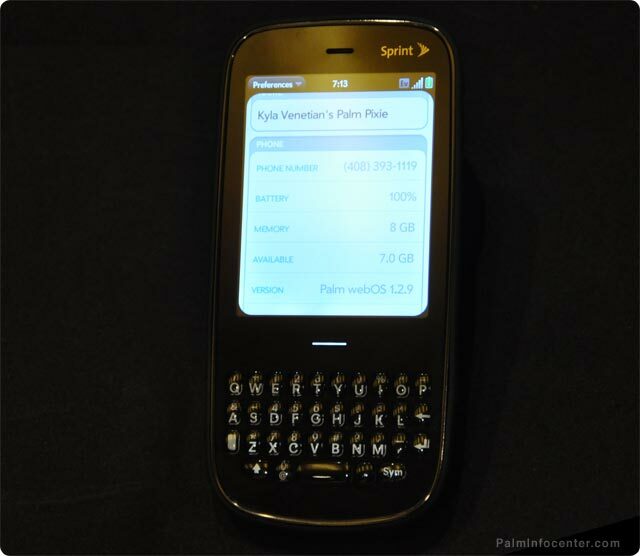 The Pixi demo unit reported the webOS version number as Palm webOS 1.2.9. 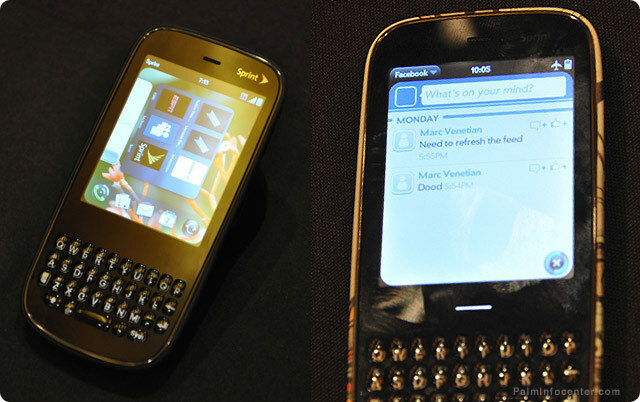 Also note the Pixi's lack of a center button, it is now completely virtual and simply illuminates when activated. But now there's this whole uproar over the frikkin size of the /var partition for apps -- with some people reporting FIFTY is the top number of apps they've been able to install! This is just frikkin unbelievable. Who wants just 50 frikkin apps?! It isn't so much a matter of the number of apps as the total size of the partition which weighs in at around 253MB. Some people hit that size limitation in about fifty apps, some hit it as sixty, some hit it at less. I usually have around fifty apps - give or take - when the App Catalog starts complaining about a lack of memory. But I can still install many more apps through Preware. So there is already a work around for this problem but Palm hasn't implemented it yet in the App Catalog. It seems pretty silly that they still haven't fixed this problem at a time when they are starting to ramp up the app store. yes she's going to love the gesture area along with no d-pad/trackball. it's very easy, precise, and intuitive to use. NOT!!!!!!!!!!!!!!!!!!!!!!!!!!!!! Well, she has an iPhone at the moment and is not thrilled with it.